[0:14] <BillyBag2> Hi, had some trouble with updates, any advice? sudo apt-get update, then, sudo apt-get upgrade, has worked fine before. [0:15] <BillyBag2> I get errors decompressing and then the FS is screwed up. Had to restore whole lot from backup. Happended a few times now. [0:16] <BillyBag2> Posibly not updated since Jan this year. [0:17] <BillyBag2> I loose the error messages, somthing like failed to decompress package. Then FS is screwed. fsck will not fix it. [0:18] <BillyBag2> OK, thanks, I will try that channel. [1:18] <neocharles> Someone mentioned changing the owner and group to another group that's already defined, then adding my user account to that group? [1:35] <BillyBag2> I think as standard there is some console axtivity at startup on uart port. This can be disabled. Not sure how. [2:18] <Firehopper> isnt there a apt-get that can do that? [4:59] <ShiftPlusOne> yup, it's that time. [5:00] <_inc> the time when we should be asleep but can't? [5:00] <pksato> 1:00 am here. [5:00] <Hodapp> the time when I've been saying "I should go to bed..." and I start to realize that I've been saying that for 4 hours? [5:08] <SteveThing> anyone available to help with wireless firmware? [5:09] <SteveThing> When I try to apt-get install firmware-linux-nonfree, i get "files list for package 'libqt4-xml:armhf' is not a regular file"
[5:11] <plugwash> what does ls -l /var/lib/dpkg/info/libqt4-xml:armhf.list say? [5:41] <Grievar> what are practical data rates for spidev on raspberry pi? [5:51] <darkowlzz> Hi, I have a raspberry pi, model-B. It's running on Raspbian with 4GB SD card. When I connect the keyboard/mouse to the usb, it doesn't work. Am I missing something? [5:51] <Grievar> Why are all of the I2S pins not exposed on the GPIO header? [5:51] <Grievar> darkowlzz: "it doesn't work"? [5:52] <SteveThing> what's the output voltage and amperage? [5:53] <Grievar> er what? you can access the contents of the flash drive? [5:53] <Grievar> if it "doesn't work"
[5:54] <SteveThing> darkowlzz: Let's clarify.. what doesn't work when you plug in mouse/keyboard? Is the the mouse, the keyboard, or the RPi itself? [5:55] <Grievar> that's what you meant by "it doesn't work"
[5:55] <SteveThing> darkowlzz: what kind of mouse and keyboard are you using? [6:05] <darkowlzz> Grievar: found anything? [6:10] <SteveThing> darkowlzz: have you tried to do CTRL+Esc at the desktop, does the "start" menu appear? [6:12] <SteveThing> i notice the mouse doesn't show up... have you tried disconnecting the mouse and see if the keyboard works then? [6:17] <SteveThing> woo, fixed my wireless card! [6:23] <SteveThing> is the cable longer than 5 ft? [6:30] <SteveThing> do you have another cable or power brick? [6:31] <SteveThing> does the RPi have a wifi manager installed by default? [6:32] <SteveThing> how did you configure your wifi? just modify /etc/network/interfaces? [6:38] <darkowlzz> SteveThing Grievar Zhaofeng_Li ShiftPlusOne , Thanks a lot. I will get a >=1k mA and try it. [6:58] <SteveThing> shouldn't it grab that from the dhcp server? [6:58] <SteveThing> ping 8.8.8.8 "connect: Network is unreachable"
[7:17] <Arthur_N> hi folks, still having trouble getting my Pi to work. dd doesn't copy the whole image; it says "No space left on device" after 1 GB even though it should have more than enough space, and I've tried with 3 different SDHC cards from 3 different manufacturers. ANY help at all is greatly appreciated! [7:18] <SteveThing> Zhaofeng_Li: shouldn't that be done automatically when the wlan0 iface comes up? or eth0 goes down? [7:19] <Triffid_Hunter> Arthur_N: see what cat /proc/partitions says about your card.. are you dding to the disk or a partition? [7:21] <Triffid_Hunter> SteveThing: are both the wireless and the ethernet connected to the same network? [7:21] <SteveThing> why would i bridge them? [7:23] <Triffid_Hunter> Arthur_N: umm doesn't need to be mounted to see partitions.. in fact, you need to be able to see the partitions before you can mount them! [7:30] <SteveThing> ah, so if i were using a powered hub, it might not be an issue? [7:31] <Triffid_Hunter> Arthur_N: sounds like your computer isn't seeing your SD cards at all.. what have you been DDing onto? [7:42] <SteveThing> so if I use a dedicated PSU for my Pi and then plug a powered hub into one of the onboard usb ports, the hug could feed power back through that power? [7:46] <SteveThing> so a set of diodes isn't required from the pi usb port to the hub? [8:14] <plugwash> I'm guessing no easier or harder than writing any other audio driver for linux, the linux kernel has a SPI driver and a concept of a SPI bus and devices already. [8:26] <plugwash> the two certainly share some characteristics but I wouldn't really call I2S "SPI with a specific data protocol"
[8:28] <Triffid_Hunter> Grievar: you mean MOSI, SCK and CS? [8:34] <Grievar> "tell the kernel it's I2S"? [8:43] <topias> My RPi is freezing constantly, I have tried 3 different SD-cards (acc. http://elinux.org/RPi_SD_cards all should work), 3 different power source, measure voltage over F3 fuse and everything seems to be fine. How I should go forward in troubleshooting? [8:45] <Grievar> topias: do you have a screen or serial console connected to it? [8:47] <topias> Grievar: I've tried both. RPi is freezing totally, only the red light will stay on. [8:48] <Grievar> topias: so it's not kernel panicking? it's just hardlocking? [8:48] <Grievar> topias: nothing shows up on the serial console? [8:51] <Grievar> topias: Er, what's the last thing printed on the serial console? [8:53] <Grievar> topias: Er, you do understand what a /serial/ console is right? [8:56] <topias> Grievar: No, I don't understand what do you mean by this console. [8:58] <Grievar> topias: Does it still boot okay if you don't load the GUI? [9:13] <Toordog> is there any modules to send an a sms when plants need water or mineral addition? [9:14] <topias> Grievar: I think there will be some failures in hardware. If the board will be turned on immediately after freeze it will run shorter time instead of plugging the board on after longer time. [9:19] <Grievar> topias: do you have a second Pi to test against with same power source/SD card? [9:27] <topias> Grievar: I just recheck voltage and it's 5,07 between TP1 and TP2. I'm using 1A power source. Any ideas? [9:56] <topias> Grievar: Maybe I'll return the device to the local store where I bought it. I don't believe in SD problem because according the elinux list all three should work properly. [9:59] <topias> Grievar: I just start RPi without GUI. It worked almost 5 minutes in console. I just wait by doing nothing. Then suddenly it just went down. Should RPi use SD card in console when user is doing nothing? Can I eliminate SD problem? [10:02] <Xark> topias: In general, yes, Linux will access the disk at seemingly random times. Even if you aren't doing anything, there are various system processes that may access the disk in the background. [10:02] <Xark> topias: However, doing so should not crash (if the SD card is behaving). [10:05] <Xark> topias: Have you tried other SD cards? Perhaps try reimaging it. In my experience SD cards are not the most reliable (and RPi drivers are a bit picky). [10:08] <topias> Xark: I've used also three different power sources and measure voltages in the bord, also over F3 Fuse. Everything looks fine. [10:14] <Xark> topias: Interestng. So just idling for a bit on command line "hangs" the RPi? [10:15] <Xark> topias: I have weeks of uptime on my RPi (acts as a little sshd "tunnel server"). [10:17] <Xark> topias: Sounds like your RPi isn't working right (for some reason). [10:18] <Xark> topias: They aren't the most reliable machines (I have certainly seen mine crash - especially with USB devices), but I haven't experienced lockups like you describe. I have several RPis (and tend to us a really old one and a newer 512MB one). [10:20] <plugwash> is the pi in question made in china? [10:22] <topias> plugwash: The first RPi I bought on the local store was totally broken. The first capacitor near the microUSB socket was dropped away. Too less heat was used to make that board. [10:25] <notlistening> Has anyone expereinced SD cards not booting, I have three of the same cards and one after another they have stopped booting on my pi any ideas? [10:28] <notlistening> Any way to fix it? [10:33] <notlistening> I have completely formatted and rewritten the card with no joy, it is that the Superblock as marked as unusable and can no longer be accessed? [10:49] <gordonDrogon> the only time I've perosnally experiences SD card issues was when overclocking. [10:49] <gordonDrogon> I don't overclock anymore - no more SD card problems. [11:29] <coffe> Howdy .. where it here we yesterday did talk about ipv6 dhcp ? [11:45] <gordonDrogon> there was some chat about it. [12:01] <gordonDrogon> /var/log fills up - normally overnight the log-files get recycled, but if you don't leave the Pi on overnight, then they just grow and grow! [12:01] <gordonDrogon> personally... I'd turn most logging off on a Pi - especially if it's being rebooted. Just stop rsyslogd from starting. [12:02] <gordonDrogon> unless I were running it 24/7 on some critical application though. [12:05] <coffe> gordonDrogon, ofc i do ..
[12:05] <gordonDrogon> I have several Pi's and really can't be bothered reading their logs. not much point I reckon. [12:06] <coffe> gordonDrogon, where it you that i where talking with about ipv6 and dhcp ? [12:06] <gordonDrogon> I was involved, yes. [12:06] <coffe> gatherd the setting i could remeber i changed/added..
[12:08] <gordonDrogon> ah, interesting. I'll need to have a look at that when I get more time - thanks! [12:09] <gordonDrogon> the thing I need to do is stop linux autoconf. [12:09] <gordonDrogon> but I can play with that on my laptop now - don't like rebooting my workstation. [12:10] <gordonDrogon> ok. sounds good. [12:11] <gordonDrogon> now, back to hacking the gpio command! [12:11] <coffe> done anything funny ? [12:15] <coffe> gordonDrogon, i cant make up my mind on what to order..
[12:19] <mervaka> coffe: looking for project ideas? [12:20] <gordonDrogon> I'm going to do a 8x8 'life' simulation. [12:20] <gordonDrogon> inspired by Amy Mather ..
[12:20] <gordonDrogon> mervaka, I have considered it! [12:21] <mervaka> coffe: how savvy are ypu with electronics? [12:22] <gordonDrogon> mervaka, I was looking at a 8x8x8 x3 cube - but that's a lot of RGB LEDs and a lot of wiring! [12:22] <mervaka> coffe: ok. what interests ypu generally? [12:28] <gordonDrogon> Triffid_Hunter, sure, not not as pretty..
[12:29] <mervaka> would be interesting to set them onto layers of a transparent pcb..
[12:29] <gordonDrogon> I guess I could just do it with single colour LEDs. [12:33] <mervaka> might have to try that..
[13:22] <gordonDrogon> just been looking at venues, pricing, etc. [14:44] <gordonDrogon> rain turns to hail. what a weird weather day. [15:01] <Hodapp> gordonDrogon: don't you live in a place where it either rains or hails 24/7? [15:32] <gordonDrogon> Hodapp, I live in one of the wettest towns in Devon. [15:40] <gordonDrogon> woo hoo thunder! Lightening! [15:40] <ReggieUK> is it very frightening? [15:45] <hays> Can a r-pi be used to hook to a projector and media server to be an interface for playing movies? digital audio output? [15:46] <ShiftPlusOne> if the projector has hdmi in, I don't see why not. [15:47] <mjr> yeah you need to be able to get the audio via the hdmi. Or settle for mediocre stereo, or get an usb sound stick. [15:49] <ShiftPlusOne> Hodapp, Schlurmgh! Why are we making strange noises again? [15:50] <ShiftPlusOne> well, I am exagerating for effect, heh. [15:50] <Hodapp> gordonDrogon: ...you just lost power? [15:53] <gordonDrogon> it's moving away now - that last crash was about a second away. [15:53] <Hodapp> hays: I just hardly ever watch TV. [15:53] <gordonDrogon> hail/rain is easing off..
[15:53] <gordonDrogon> we get lots of rain here, but only 1 or 2 good thunderstorms a year. [15:57] <gordonDrogon> slowly getting the new site going. [15:57] <hays> what was that 5 years ago or so? [16:04] <DDave> gordonDrogon, I have just opened your link, there is a charset problem, in the source-code your tabs (I presume) are encoded as weird A-letters for me. [16:11] <Hodapp> I'd use it. [16:12] <gordonDrogon> DDave, Hm. thanks. will check! [16:13] <gordonDrogon> Hm. weird A's for me in Chrome too. seems ok in firefox. bother. it's not done that before. [16:13] <RiXtEr> it looks like it has hdmi ports. [16:36] <ShiftPlusOne> don't know how well rpi-update works with fedora. [16:37] <chod> fedora on a raspberry pi? [16:38] <sinni800> ShiftPlusOne: as in? [16:38] <chod> do you need fedora ? [16:38] <TomWij> You can even run omxplayer on Gentoo on RPi without much trouble, so any argumentation about a certain distro not being able to run it is moot. [16:39] <ShiftPlusOne> fedora used to be the favoured os... a very long time ago. Now it's raspbian. Fedora was removed from the download page even. [16:39] <sinni800> seems like its like that because some nice debian advocates pushed everything for debian only? [16:39] <ShiftPlusOne> sinni800, did you run rpi-update and restart without trying to modify any of the files manually or using yum afterwards? [16:40] <ShiftPlusOne> yes, did you run rpi-update AFTER using yum? [16:40] <TomWij> sinni800: driver says min 3, library is only 2, so you need to upgrade the VC libraries. [16:40] <chod> TomWij: oxm player wont work on riscos. [16:40] <ShiftPlusOne> where does fedora store the vc libs? [16:42] <TomWij> sinni800: If the master branch doesn't work, you might want to opt for the next branch. [16:43] <ShiftPlusOne> Why do the fedora users think there is a conspiracy against it? [16:45] <ShiftPlusOne> Nope, it just looks like it. [16:46] <ShiftPlusOne> they develop on next and throw commits from there onto the main branch so it looks like the main branch is newer, since it was updated last. [16:46] <TomWij> sinni800: Though, maybe the next branch has a higher lib version whereas the master branch just kept on applying patches in LTS style. [16:51] <ShiftPlusOne> sinni800, sure it can. Last time I tried the next branch, the kernel wouldn't boot at all. [16:52] <sinni800> what is actually the difference between the 3.6.11 and the 3.6.11-cutdown? [16:53] <ShiftPlusOne> I would imagine that 3.6.11-cutdown is the cutdown version. If I wanted to know more, I'd compare the config files. [17:00] <sinni800> i put next in and..
[17:00] <ShiftPlusOne> tvservice and all? [17:02] <ShiftPlusOne> I'll just blame fedora for some reason then. Last time I saw someone with that problem, rpi-update fixed it. [17:04] <TomWij> sinni800: Are you using statically linked libraries or something? Sounds as if tvservice uses a different lib than /opt/vc. [17:04] <TomWij> So, first think to check is if the tools in /opt/vc work. [17:06] <sinni800> what is the meaning of the message anyway? where is the driver version? where is the library version? does min mean that the application wanted that at compile time? [17:09] <ShiftPlusOne> so... does copying everything to the right place help? [17:15] <TomWij> sinni800: Yeah, to use /opt/vc you need some environment files in place that tell to add that to the library loading paths. [17:17] <ShiftPlusOne> It's the place for them in other distros. I agree that it's a silly place for it, but it seems to have been set as the standard for now. [17:17] <TomWij> Yeah, according to the FHS. [17:17] <ShiftPlusOne> According to FHS it's silly or it's standard? [17:26] <chupacabra> I thought FSH only allows /opt to have userspace programs in there. [17:32] <TomWij> chupacabra: It's not just a hardware library, but all kind of different things thrown together. [17:32] <sinni800> so actually the developer of the videocore driver is at fault? [17:33] <sinni800> fix'd the script..
[17:43] <chupacabra> tomaw, ya, for sure. [17:44] <chupacabra> course one could add /opt to the list and run ldconfig i believe it is. [17:45] <chupacabra> used to be something one just did back in the day. [17:50] <chupacabra> oops TomWij . [18:16] <maxped> is there a way to edit an image file, specifically the boot.config file before loading it in an sdcard? [19:22] <aaa801> Does anyone know if its possible to read sega / snes cartridges from the gpio header? [19:31] <netw1z> hey, can you damage ur pi in such a way that wifi doesnt work anymore? [19:32] <netw1z> maybe from a overheat or something? [19:34] <gordonDrogon> mcp23017 or mcp23s17 GPIO expanders. supported natively by wiringPi v2. 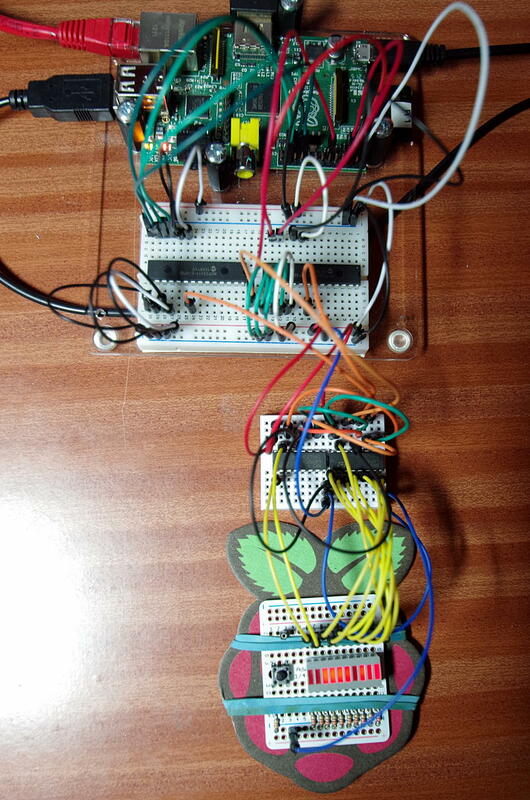 [19:35] <gordonDrogon> aaa801, http://wiringpi.com/about/more-testing-game-of-life/ <-- 32 pins. more are easy. [19:35] <aaa801> how much those things? [19:36] <gordonDrogon> about ?1 each for the chips. [19:36] <aaa801> Do i need to make a board? [19:37] <gordonDrogon> in-fact.. you could use 3 x 72595 shifts for the output address bus and a single mcp23017 for the 16-bit input. [19:38] <gordonDrogon> you need a few more pins for strobe, enable, etc. but it's all possible. [19:38] <gordonDrogon> the biggest issue is, as always, is the mechanicals. [19:42] <aaa801> gordonDrogon, it says spi and i2c extenders, what one do i need =/ ? [19:43] <gordonDrogon> whatever you think you can interface with. [19:43] <gordonDrogon> I2C is only 2 wired. [19:43] <gordonDrogon> spi needs 4 wires. [19:43] <gordonDrogon> how big are they? [19:44] <gordonDrogon> my code is not efficient for byte/word writes - it does 8 writes to the device to set the 8 bits - however using the low-level drivers isn't that hard. [19:47] <Toothpick> hey, I followed the whole guide at: "http://wiki.gentoo.org/wiki/Raspberry_Pi" but my RPi does not seem to boot. can anyone help please? [19:47] <aaa801> any lights flashing ? [19:49] <aaa801> so gordonDrogon what would you suggest for my project ? [19:49] <gordonDrogon> Toothpick, have you booted a Pi before - with e.g. Raspbian? [19:49] <aaa801> no green light attall? [19:49] <gordonDrogon> aaa801, probably a bunch of mcp23017's. 3 of them. [19:49] <gordonDrogon> Toothpick, ok- good luck with Gentoo then! [19:50] <aaa801> gordonDrogon, can i hook 3 of these directly to the header or do i have to chain em ? [19:50] <aaa801> assuming you have a 512mb pi ? [19:50] <gordonDrogon> aaa801, you sort of chain them together 1 after the other using the same 2 wires. [19:50] <Toothpick> aaa801: what do you mean ? [19:50] <eggy> loving my newer pi board -- the 512mb ram boost helps a lot. [19:50] <aaa801> Toothpick, do you have the 512mb pi ? [19:51] <eggy> 256 is.. limited. [19:51] <gordonDrogon> does it have holes in it - an almost foolproof way to work out if it has 512MB. [19:51] <gordonDrogon> hm. dark. lock chicnens up time. back in a bit. [19:52] <aaa801> does it have 2 holes in it ? [19:52] <Toothpick> maybe it is because i did not pass "rootfstype=ext4" in cmdline.txt ? [19:52] <aaa801> can you just answer our questions ? [19:53] <aaa801> when you put the sd in a pc, what drive comes up ? [19:53] <aaa801> does it have the holes ? [19:53] <aaa801> one near the hdmi and one by the usb ? [19:54] <aaa801> ok what is on partition 1 ? [19:55] <aaa801> ok is there a kernel_emergency in there? [19:55] <Toothpick> aaa801: partition 1 is "W95 FAT32 (LBA)", and not "W95 FAT32"
[19:55] <aaa801> is there a start.elf ? [19:58] <aaa801> Toothpick, you there ? [20:02] <aaa801> do you get the rainbow screen? [20:02] <aaa801> or copy the boot files from the sd that boots ? [20:06] <dlynes> SolderPI, with the rpi's gpio pins, i'm guessing the pins will go 5v high when their logic is set high? Or is it 3.3v high? [20:09] <dlynes> mjr, ok, thanks. Any idea what the 5v is for then? Or is that for the rx/tx for serial port? [20:09] <aaa801> Toothpick, any luck ? [20:14] <dlynes> mjr, so how do you tell the rpi to output 5v instead of 3.3v? [20:15] <mjr> you don't. There's only the 5v power pin on the header, all the actual io pins are 3.3v period. [20:15] <dlynes> mjr, ah, so the only use for the 5v on there is for powering the rpi, then? [20:22] <gordonDrogon> the 5v on the header can feed 5v to your own peripherals - but you can also use it to feed 5v into the Pi if you know what you're doing. [20:33] <Toothpick> angelos: the whole device or just a partition ? [20:35] * mjr 's pi wlan stick is in the mail. Possibly will get more use of it with it more readily on the network. [20:37] <Toothpick> angelos: "Seek to 3949985280:Invalid argument", does it make sense? [21:06] <dlynes> gordonDrogon, Ok, so it's primary 5v output (regulated)? [21:07] <gordonDrogon> dlynes, yes, it's off the Pi's 5v supply after the polyfuse. [21:08] <aaa801> gordonDrogon, when these parts arive you know ima be picking your brain about hooking em up right :D, got any recommended reading on using those chips ? [21:08] <Toothpick> is there a reset button on the pi ? [21:09] <Toothpick> oh, so the fastest way to reboot is to replug the usb powering? [21:09] <gordonDrogon> Toothpick, you can short the 3.3v to ground, but that's sort of not recommended. [21:09] <gordonDrogon> or the 5v. [21:10] <aaa801> gordon whats up with your example code, looks like tabs got replaced with ? ? ? [21:10] <gordonDrogon> I've used my Pi to charge my DSO quad oscilloscope. [21:12] <aaa801> gordonDrogon, with linking those chips, is connecting a extra pair of wires from the previous chip into the next ? [21:13] <gordonDrogon> aaa801, if it's I2C then yes. you connect one after the other and power them all from the Pi's 3.3v supply. [21:13] <gordonDrogon> although you can use the 5v supply, but people frown at that for some reason. [21:13] <aaa801> ok, and in code, will that just continue the pin numbers or will that require some extra code to utilize ? [21:14] <gordonDrogon> aaa801, just more pin numbers - each mcp23017 gets a 'base' and it has 16 pins. [21:14] <gordonDrogon> so you can use whatever base you like above 64. [21:15] <aaa801> will i need to avoid the pin that the continuation of the chips is attached to ? [21:16] <gordonDrogon> no - that's not a pin. [21:16] <gordonDrogon> not an addressable one. it's I2C. [21:17] <gordonDrogon> I2C is the communications bus. The chip then has 16 pins that you can use. [21:17] <aaa801> will that be fine ? [21:17] <gordonDrogon> I don't know. what dump code? [21:18] <gordonDrogon> well that looks like it just dumps it out the ATmegas serial port - presumably to a PC capturing it - you can just write it to file. [21:19] <gordonDrogon> you will have to adapt that program... but it will mostly work, or serve as the basis of your own. 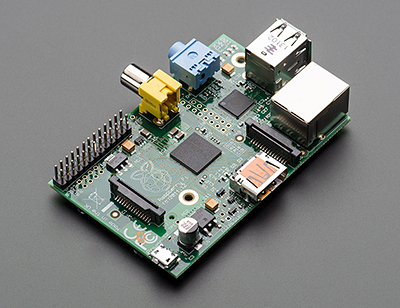 [21:25] <aaa801> gordonDrogon, how do i get the dam gpio pins hooked up from the rpi to the breadboard :3? [21:25] <gordonDrogon> aaa801, you need power & ground and the 2 I2C pins. [21:27] <gordonDrogon> aaa801, this photo: http://wiringpi.com/wp-content/uploads/2013/03/stressTest.jpg <- this chip on the right is mcp23017 - the 2 red wires are the I2C wires to the Pi. [21:27] <scummos> what does it do? [21:27] <aaa801> can i just grab that from the other power pin? [21:27] <gordonDrogon> scummos, it's a test rig for wiringPi. [21:28] <gordonDrogon> that was a 'stress test' of sorts. [21:31] <gordonDrogon> scummos, well - more for the new wiringPi software. [21:31] <[psy]> so, anyone got vlc with omxil working yet? [21:32] <gordonDrogon> scummos, that setup drives the 595's via one Pi GPIO pin, one pin from the SPI and one pin from the I2C GPIO chips. [21:34] <gordonDrogon> it's rather convoluted, but it helped me make sure the new wiringPi was operational and I can create new 'pins' out of any additional hardware. [21:37] <sixseven> Hi Dr Nick! [21:38] <Toothpick> i have XBian installed on my RPi, but my remote control does not seem to do anything. do i need to buy a remote that supports CEC? [21:39] <nbookham> @toothpick Have you enabled CEC on your TV? [21:40] <tonyhughes> Do you have android or ios? [21:40] <nbookham> On Sony TV's, the CEC control is called Bravia Sync. On Samsungs, It is called HDMI-CEC under System. [21:41] <ParkerR> Toothpick, Do you know the exact model of the TV? [21:53] <Toothpick> why does it take so long? [21:54] <nbookham> I don't know. If you can't get it working, try using Raspbian. It's more stable than Xbian. [21:54] <nbookham> Sorry, not Raspbian. Raspbmc. [21:59] <nbookham> @chris really? I thought there was. [21:59] <nbookham> oh wait. can't you use omxplayer --help? [22:01] <nbookham> I'd go to the forum. There will be someone there that would know. [22:05] <pellis> hi guys. what is a more robust (shutdowns) filesystem for the rpi suitable also for streaming? ext3 or ext4 ? [22:07] <nbookham> Hi ryanteck. I love RasTrack and Pideas! [22:12] <nbookham> Gotta go! See ya tomorrow! [22:13] <ryanteck> Have you not heard! [22:16] <ShadowJK> I've also had good success with nilfs2. I've got a logging application that runs on two different storage devices, one with ext3 and the other with nilfs2. After powerloss, the logfile stored to nilfs2 has contained more data usually. [22:30] <gordonDrogon> aaa801, I've no idea - it doesn't give enough details. [22:31] <gordonDrogon> you coule probably solder it to stripboard and put on header pins. [22:33] <pellis> ShadowJK: why no fsck? [22:45] <pellis> is it because it expects an OS on the other side? [22:51] <gordonDrogon> well stack me sideways: gpio -x mcp23017:100:0x20 read 115 <- works! [22:56] <ivotkl> I need a solution and I can think of two possibilities. To install everything blindly (Internet access, no near screen to connect) or to download packages (using windows, currently using above mentioned site) and install them from a pen drive. [22:59] <ivotkl> And by the way, should I download armel architecture or i386? [23:01] <pellis> mjr: yep, that's what happened. [23:05] <ivotkl> I need a solution and I can think of two possibilities. To install everything blindly (Internet access, no near screen to connect) or to download packages (using windows, currently using above mentioned site) and install them from a pen drive. [23:05] <ivotkl> And by the way, should I download armel architecture or i386? [23:07] <pellis> mjr: what do you think about daily powerup / shutdown of rpi with a rotating HDD ? will I kill the HDD? [23:07] <ivotkl> Great. Thank ryanteck. Shall I downlad the armel file and all its dependencies? [23:17] <netman87> still no Xorg acceleration? [23:23] <gordonDrogon> yes it is. [23:24] <dRbiG> netman87: you have any other boards on mind? [23:25] <netman87> maybe beagle or some arduino "dev-kit"
[23:28] <netman87> yeah they seems to be pretty neat. its just price to get it. almost 200eur is little bit over what i could easily pay for "hobby device"
[23:29] <mjr> would you consider it a warning if you were thrown out of a bar? [23:33] <netman87> actually word i used doesnt seem to be foul language in my option. [23:34] <netman87> but yeah it should have readed topic and gone with different word. [23:35] <netman87> isnt it easier to make script to kick people? [23:36] <netman87> isnt that foul language? [23:39] <mjr> different rules for different people? [23:40] <netman87> mjr, "we will deal with it how WE want"
[23:42] <gordonDrogon> aaa801, once for each chip. [23:42] <aaa801> gordonDrogon, so just call it 3 times in a row? [23:42] <aaa801> or does it need different bases or ? [23:43] <gordonDrogon> aaa801, yes, with the 3 different I2C addresses and pinBase commands. [23:44] <aaa801> so pinbase should be one higher then the last pin on the previous chip ye? [23:44] <gordonDrogon> aaa801, 16 more. [23:44] <gordonDrogon> aaa801, as each chip has 16 pins. [23:46] <netman87> but idea for what that other guy said before is that "rewriting to flash based memory device is bad so go for HDD"
[23:47] <ReggieUK> jeez, so you moan when we kick people and you moan when we don't, fickle, much? [23:53] <bacteu> netman87: is that a netbook? [23:53] <netman87> bacteu, special series from thinkpad. they are full laptops for business.